Everything we need to get your job done right. Amada FOM2-3015NT, 4000 watt, flying optic can cut up to .75” thick mild steel, .50”thick stainless steel, and .25” thick aluminum. Maximum sheet size 60” x 120”. Amada Pulsar model 2415 a 2000 watt system that cuts up to .375” thick mild steel,.25” thick stainless, .125” thick aluminum, and .090” thick titanium. Maximum 60” sheetwidth and a repositioning system allows for virtually any length sheet. Ermaksan 66 Ton Power Bend Falcon Press Brake with 83″ bed, capable of 9″ DeepBox with 4 axis back gauge. Ermaksan 150 Ton Speed Bend Pro Press Brake with 102″ bed with 5 axis back gauge. Wysong 14 ft. at 140 tons hydraulic brake with a state of the art Cybelec controller with auto-crowning for perfect forms on long lengths. Accupress 3 axis CNC hydraulic brake. 48” at 25 tons. A machine with same accuracy as the one above. Includes a third axis for multiple forms in one operation. 2 DiAcro hydro-mechanical press brakes. A 72” wide at 25 tons and a 96” wide at 35tons. Each equipped with a CNC back gauge. Used for long and short run production. Chicago 96” at 55 tons mechanical brake. Another trusted workhorse able to perform multiple operations in one setup. A large selection of knife, offset, and gooseneck dies can be cut to any length. 10ga x 60″ pyramid roller. MIG and TIG welding at 6 weld stations, 3 Acorn weld tables, and other standard tables. With the size of our tables and variety of clamps for both short and long run jobs. 40 KVA spot welding capability, up to 10 gauge. Marvel 81A vertical saw. It has CNC feed and tilt capabilities: 23’ feed table and 15’drop table. This saw can cut 45 degrees in either direction: 20”x18” max piece cut sizeat 90 degrees and 11”x18” max piece cut size at 45 degrees. Tool capabilities to build forming dies from laser cut shapes in house. No matter whatthe intricate forming operations may be for the component, we can provide quality withcompetitive pricing. Wysong 1072, 10 GA x 6 ft. with sheet support system. Niagra 41”x 16 GA shear. NC angle roller; capable of rolling rounds, squares, rectangles, angle up to 1.5”, andschedule 40 material. Large selection of tooling in house. 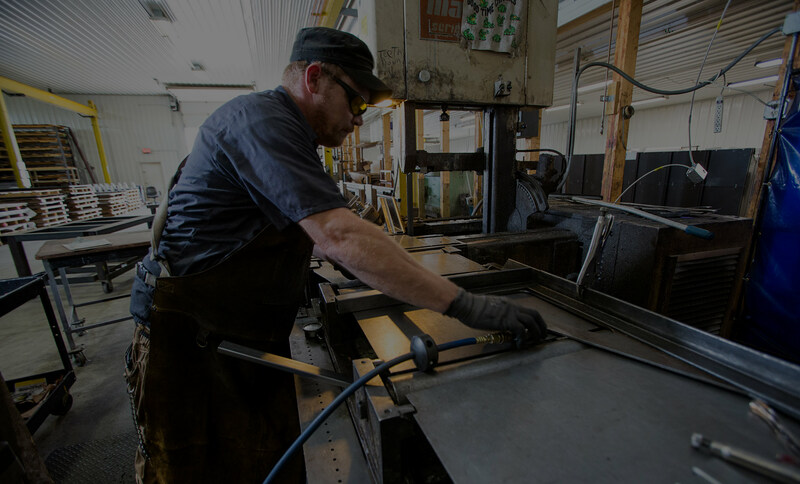 We offer a non-directional finishes, edge cleaning capabilities, de-burring, many finishtypes on weldment and assemblies. We offer a straight-line finish for tube or sheet products and have 6” and 9” wideTimesavers. We offer a variety of different grit finishes that can apply a desired finish,on aluminum, stainless, or mild steel parts. Powder coating and a variety of plating options offered. A full service-engineering department to develop value added and reverse engineeredsolutions for fabrication. Our Metalsoft FABRIWIN CAD/CA software allows us the ability to import yourdrawing files or create new precision files from your prints. Solid Works 2018 engineering software. Truck access dock and overhead 6000 lb. roller crane for inside load and unloadingfrom flatbed truck or trailer. Haegar hardware installer, including a large selection of PEM hardware. 5’ power roller x 14 ga.
9”x 9” x 7 ga. power notcher. Drill, tap, and countersink capabilities for all types of metals. Uni-Tools for tube and flat punching and notching in press brakes. Strippit Super 30/30 single-station with 30 ton punching capacity. Many stock punches available for in round, square, rectangle, “D” shape holes. Job Boss manufacturing software used for estimating, shop control, orderentry/tracking, and cost evaluation. Most common materials kept in stock. Please contact us with any questions that you may have, our dedication to fabrication is only measured by your satisfaction.